To celebrate the international Infant Mental Health Awareness Week – 11-17 June 2018, we are launching our Speaking for the Baby Campaign. We love advocating for babies. At the Centre for Perinatal Psychology, we help parents ‘see’ their baby with fresh eyes, and understand how their baby communicates. Babies have their own language and ways of communicating and it’s up to us to read them. Some babies are clear and easy to understand and some babies need more patient decoding! One of things we love doing and encourage parents to do, is to curiously wonder about what is going on inside for their baby. We like to wonder about their minds – what they might be sensing, feeling, thinking, wanting, needing, experiencing. And if we were to put that into words, well, we’d be ‘speaking for the baby’! The idea of speaking for the baby came from another baby-devotee, an American psychoanalyst and social worker, Selma Fraiberg. When working with parents and babies she found that putting words on what the baby might be experiencing helped parents orient their minds to their baby’s mind. This helped them understand, get-to-know and enjoy their babies more. So here we are, decades later with our attempt to put words on the infant’s experience: To think about babies and how they might experience being in the world. 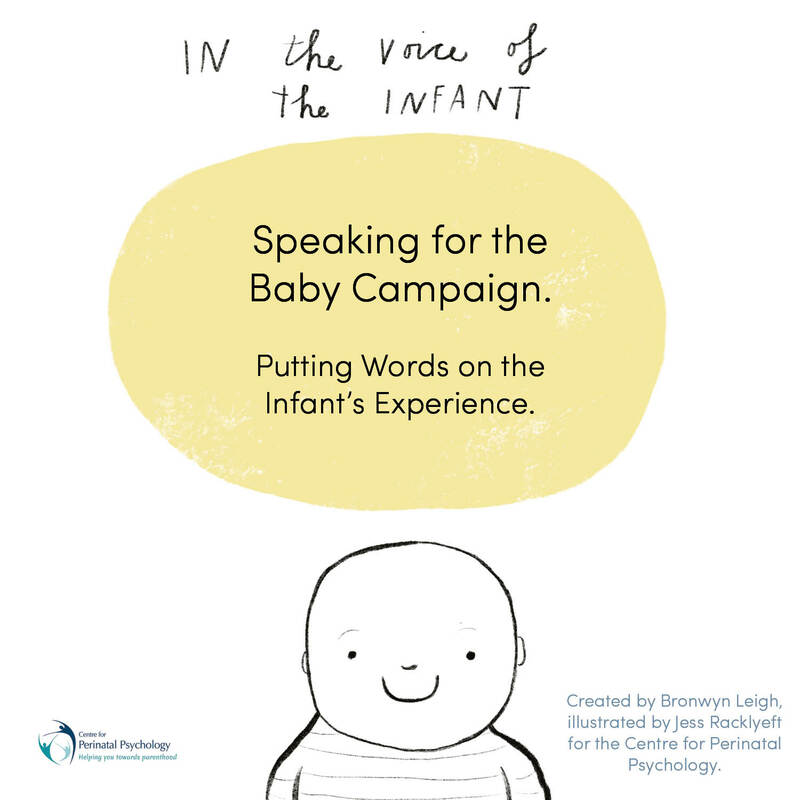 Our Speaking for the Baby Campaign is a series of illustrations bringing voice to the infant’s experience, along with downloadable handouts with description around the illustrations. These are resources that can be widely shared. Look under our ‘Resources’ section for the sharing conditions and to access the illustrations and handouts. We think this campaign might be helpful for parents and the professionals involved in parent and infant care – and ultimately for babies! We have created this with the help of the supremely talented Jess Racklyeft, a Melbourne-based illustrator who has beautifully brought our ideas to life. Dr Bronwyn Leigh is a clinical psychologist, perinatal and infant clinician and early parenting consultant. She is the Director of the Centre for Perinatal Psychology. She consults in Fairfield and Croydon, Vic. Bronwyn specialises in the psychological aspects of becoming a parent, the emotional development of infants, and parent-infant relationships. Bronwyn co-authored the book Towards Parenthood: Preparing for the Changes and Challenges of a New Baby. Reach out to us if you are interested in getting to know your baby or if you are struggling with your baby – we can help! Many parents need additional support during this time – we can be part of your village. To access our services, locate a psychologist near you: search by Location. Call us on 1300 852 660 or contact us to make an appointment or enquiry.